Finally! 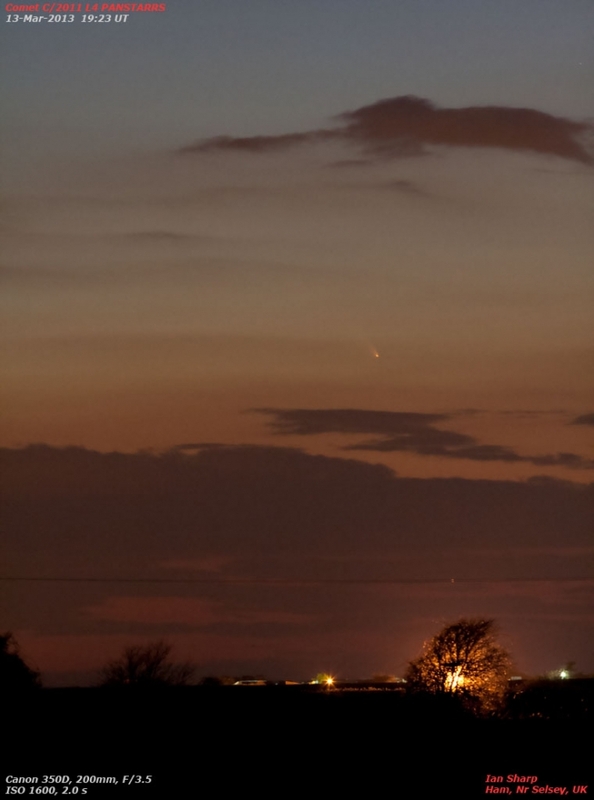 A clear night to see and capture an image of Comet PANSTARRS. There has been a terrible spell of weather here in the UK recently, but last night I had a decent clear spell just after sunset. This time I used my ATIK-383L CCD camera through my 130mm APO refractor which gives me a field of view of 69′ x 51′ – just right for this comet. The image below was the first one in a fairly dark sky because the comet has moved away from the Sun considerably since I last imaged it. So, although the comet has faded (I couldn’t see it with the naked eye), it is better placed for CCD imaging through telescopes. This image is an averaged stack of 28 separate images. 18 of these were 60 second exposures, the remainder being 90 seconds (I increased the exposure as the sky darkened). This is why the stars appear as trails, because I registered each image on the bright nucleus of the comet before stacking them. It gives an idea of the relative movement of the comet against the background stars over the 30 minutes or so from beginning to end. There is a notable ‘anti-tail’ visible in this image. It is the spike stretching out at about 8 o’clock from the head of the comet. This is caused because there can be a considerable amount of dust contained in the flat plane of the comet’s orbit, and this is concentrated near the head of the comet. If the geometry of the orbit, and the angle from which we view it are right, an anti-tail can sometimes be seen. Occasionally it can stretch away in the opposite direction to the regular dust tail being driven back by the Sun. Comets Comments Off on Comet PANSTARRS at last! At last some better weather here in the UK, and I’m pleased to have been able to see and photograph Comet C/2011 L4 PANSTARRS at last. I did manage to grab a rushed image yesterday in between the clouds, and this is shown at the end of this entry, but this evening I had better luck and caught the Comet with both a 130mm F/7 APO refractor and a 200mm telephoto lens. (Both using a Canon 350D DSLR camera). Details are on each image. This one is with the telephoto, the lights in the distance are on the Isle of Wight about 5 miles away. On this one, a scale of 30′ (minutes of arc) is marked which is roughly the apparent diameter of the Moon. Here is my first image from 12th March. M106 is an interesting galaxy! Situated near the handle of ‘the plough’, in the constellation of Canes Venatici, it is roughly 22 million light-years away, and is known as a Seyfert galaxy which means it has a very active nucleus. In fact, at the centre of M106 is a super-massive black hole. 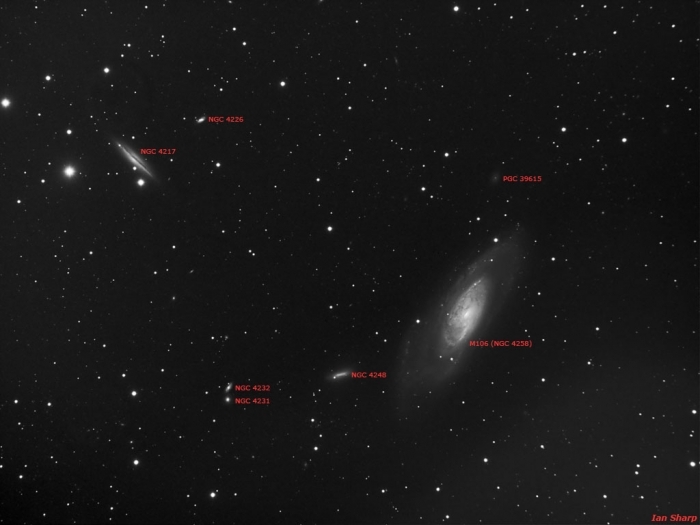 Now, our Milky Way galaxy has one of those too, as do most galaxies but not as big as the one in M106. It is the material falling into the black hole that causes x-rays and other unusual emission lines to pour forth from this galaxy. As for the details of how this image was obtained. It was taken over some clear spells during 3 nights in late February and early March. A total of 27, 10-minute exposures were collected over this time through a white (luminance) filter, which is why this is a mono image. I will try and collect the R, G and B colours soon. The telescope was my TS 130mm APO refractor at f/7 and the CCD camera used was my ATIK 383L. Moon Mosaic finished at last! Phew! 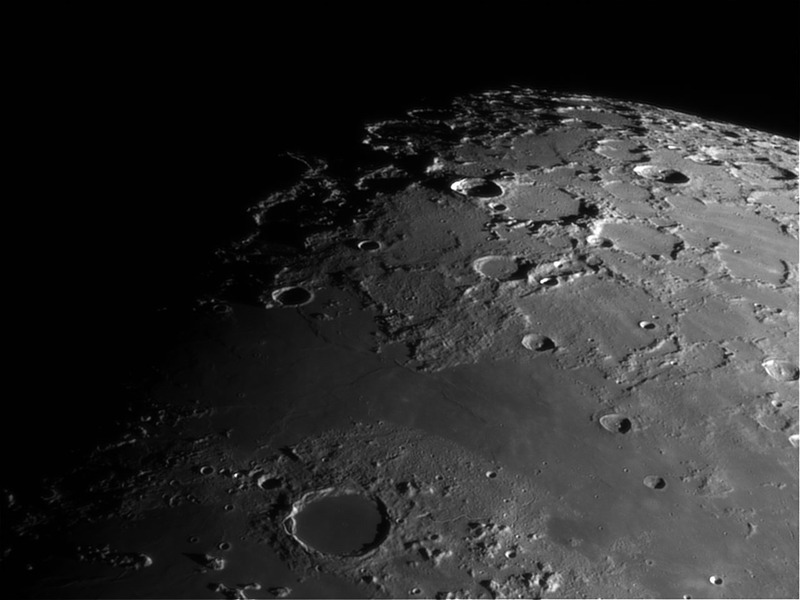 I’ve finally finished working on a large lunar mosaic from last month (Feb 19th) when the Moon was 9.5 days old with a phase of just under 69%. I previously posted another mosaic from the same evening here which was taken with the same 130mm APO telescope and QHY5L-II camera, but at prime focus. 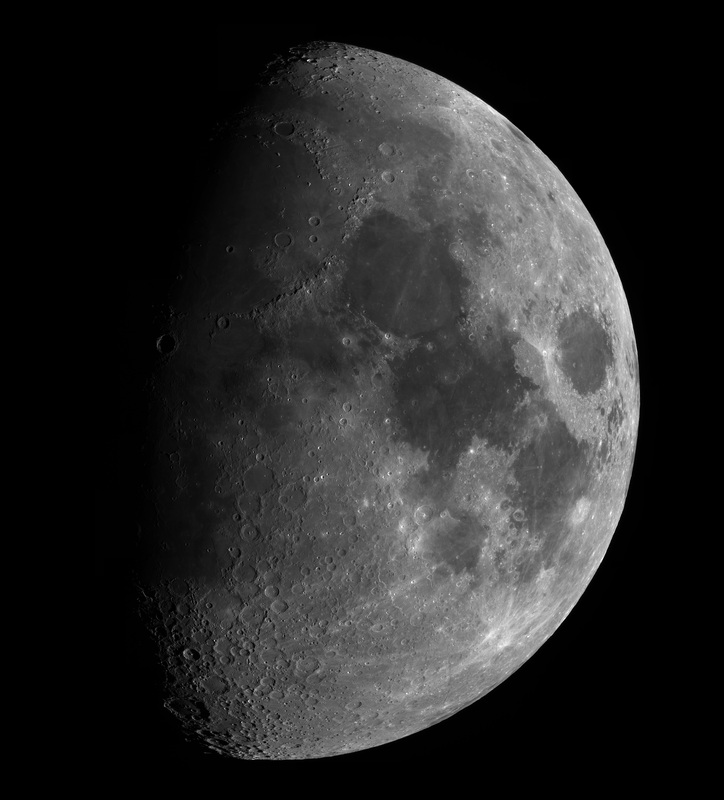 This bigger image was taken with a 2x Barlow and, with the extra projection, gives a scale over twice the previous result. In this image, I had to stitch together over 50 images to create a full lunar mosaic. The result is about 35 mega-pixels (5700×6300), and the jpg is about 3.5 Mbytes. Please click on the following link to see the full-sized result. Please make sure to expand the image to its full size when it has finished downloading into your browser. Then you can pan around the moon. Below is one of the 50 or so images that were stitched together in Photoshop to create the full mosaic. 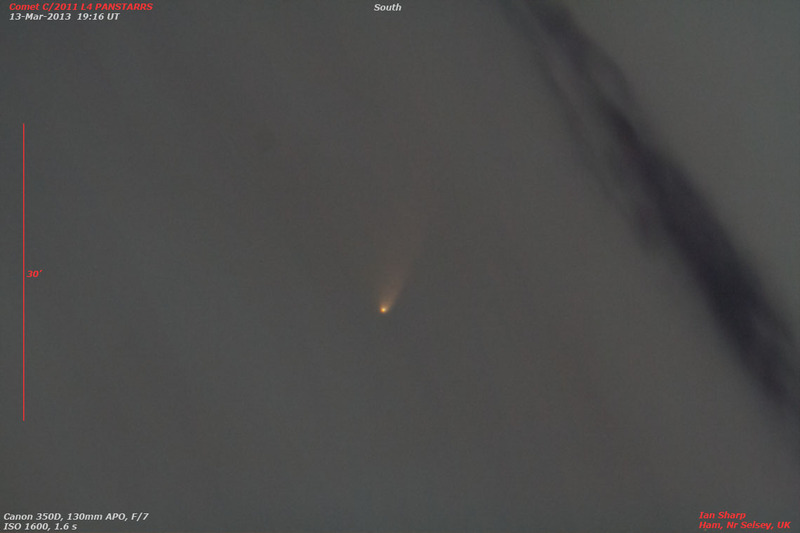 I’m very excited about the Comet PANSTARRS (full name Comet C/2011 L4 PANSTARRS). It is due to be at its best for us in the Northern hemisphere in mid-March 2013, and since it is March 1st today, I thought it was time to get ready for it. Firstly the name: Pan-STARRS stands for “Panoramic Survey Telescope And Rapid Response System” which is a wide-field imaging facility developed at the University of Hawaii’s Institute for Astronomy. Details about the facility, which is not fully completed, are here http://pan-starrs.ifa.hawaii.edu/public/home.html. The comet was discovered on June 6th 2011 and because it is classified as a long-period comet, it takes the ‘C’ prefix (as opposed to ‘P’ used for short-period comets). 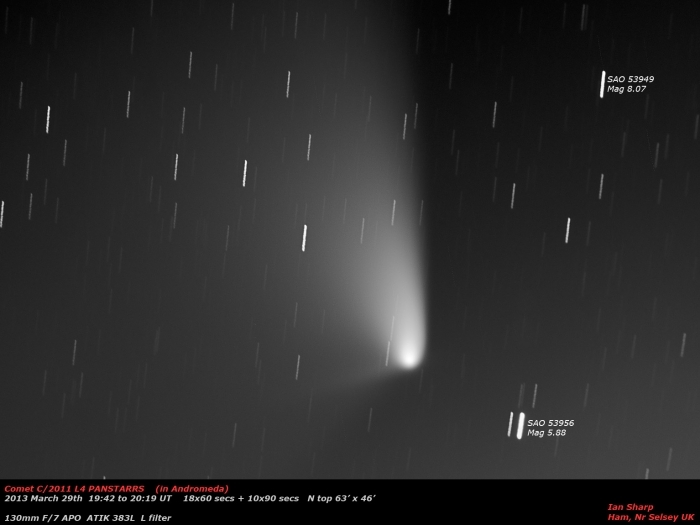 Comet PANSTARRS is the first naked-eye comet of 2013, and it is currently putting on a good show for our colleagues in the Southern hemisphere; Yesterday it was reported at magnitude 2.6 with a 2 degree tail, and it is still brightening. So, the comet is currently heading towards its perihelion, which is the closest to the Sun it will get, and it will reach there on March 10th. The perihelion distance will be about 0.3 AU (1 AU, or Astronomical Unit, is the distance of the Earth from the Sun). Then, after it has rounded the Sun, and gets away from it a bit more, it will start to appear to observers in the Northern hemisphere. I’ve put together a couple of finder maps below. The first shows where the comet will be at sunset on March 12th. The map is based on the latitude of the South of England, roughly 50 degs N, and sunset will be about 18:00 UT give or take a few minutes depending on where you are. 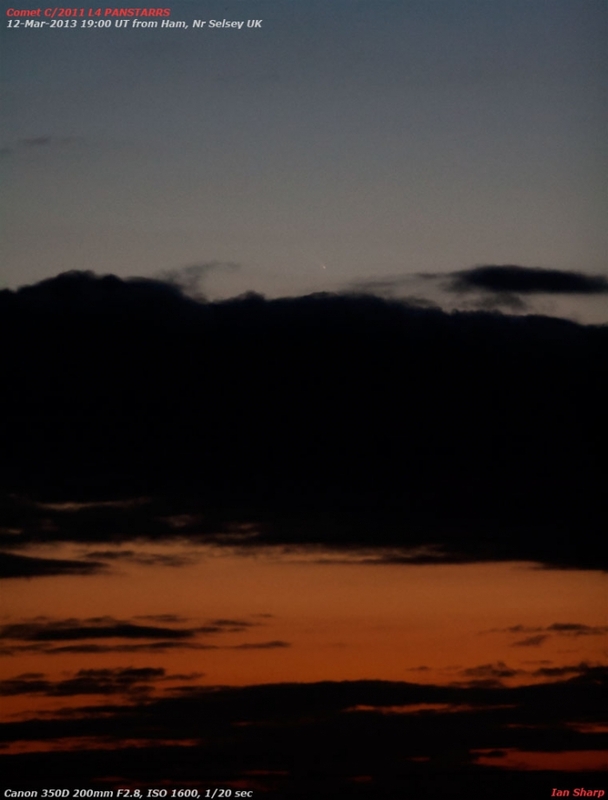 You need to looking West just after sunset, and the Moon will be a very thin crescent, just over 1 day old. You may find you miss it completely before it gets too low, following the Sun. Mars will be below the Moon, possibly even harder to spot. The comet itself will be slightly up and left of the Moon. On this map, the head of the comet is about 12 degrees above the horizon, and will get lower as the minutes tick by. The tail should be stretching away from the direction of the Sun. You should have some binoculars at the ready and it should be a lovely sight in them, depending on how bright PANSTARRS has become! Interestingly, the planet Uranus is very close to the head of PANSTARRS on this day and, at magnitude +6, may be visible in a decent pair of ‘bins’. Those with a DSLR camera should use a tripod and try taking exposures of several seconds. Set your camera to manual focus, and focus on the Moon, or Mars or any stars you may see in the darkening sky (your autofocus won’t work!). With the camera in fully manual mode, set the aperture as fast as it will go (the smallest number – f/4 for example), and the ISO setting to 800 or 1600. Try exposures of 30 seconds or so. Mess about with the exposure time – the camera should reveal more of the comet than you can see with your eyes. 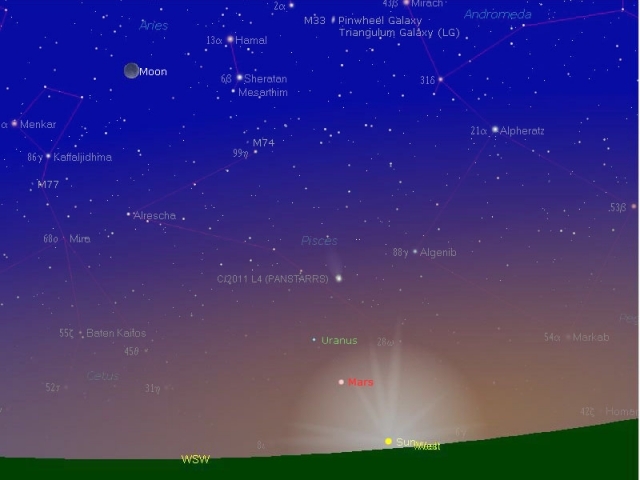 The following map shows the comet on the evening of the 15th March, also at sunset. You can see that, although it has moved a few degrees from the 12th, there are plenty of evenings to try and spot it. 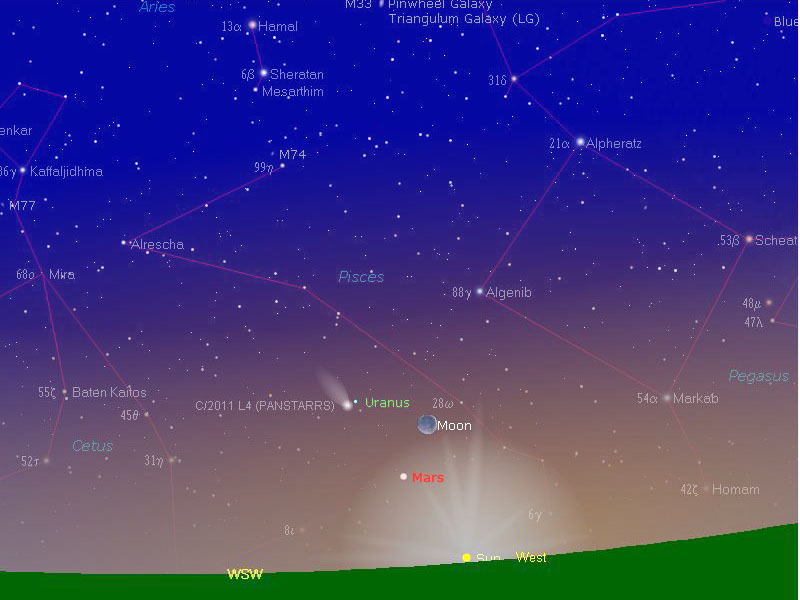 Now the Moon is much higher in the sky, and will be showing a phase of about 16%. Good luck! Let’s hope it puts on a good show. Jupiter – A case of the blues!